Following the 27-10 loss to the Miami Dolphins in the preseason opener, the New York Giants look to get back on track against the Buffalo Bills on Saturday. Coming into the game the Giants are dealing with several issues as they continue to evaluate players and determine what the 53 man roster will be. The suspension of kicker Josh Brown for the first regular season game due to a violation of the NFL’s personal conduct policy along with a slew of injuries will allow for more opportunities for other players against the Bills. Though Josh Brown is eligible to participate in all preseason practices and games, kicker Tom Obarski will be seeing a lot of the field on Saturday. “We’re going to give Tom an opportunity to kick a lot this Saturday and we’ll see how he does. He has a golden opportunity.” That’s coach Ben McAdoo on kicker Tom Obarski. Obarski is a first year kicker who played at Concordia College in St. Paul Minnesota and has yet to kick in a regular season game. Whether Obarski is the man who will be doing the kicking in game one of the regular season remains to be seen but he will certainly have a chance against the Bills to show what he’s capable of. While at Concordia he established school records in field goals made (44) and points for a kicker (250) . He also holds the distinction of kicking the longest field goal of the season in the NCAA Division II, which also happens to be the Concordia school record ( 59 yards vs. Augustana in 2012 ). Obarski’s performance is one to watch for on Saturday. Brown will be eligible to return to the Giants’ active roster on Monday, September 12 following the team’s September 11th season opener against the Dallas Cowboys. 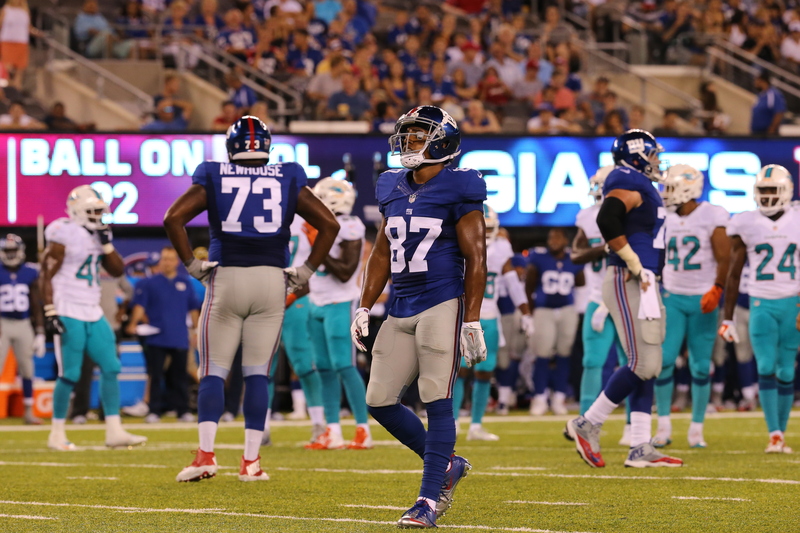 Surprisingly Victor Cruz (Groin ), and Eli Apple (Strained Lower Leg Muscle) did travel with the team, as well as Justin Pugh (bruised shoulder ). It’s unclear if any of these players will make it onto the field but one can’t rule it out if they’re on the sidelines. Eli Manning and the first team offense will get the opportunity work together in game conditions for the first time in the preseason. Giant fans will certainly revel in seeing Odell Beckham Jr. on the receiving end of an Eli Manning pass again but for the coaching staff it’s about the young receivers competing for those valuable roster spots. With Geremy Davis staying home there are several wide receivers to watch. First off, 2nd Round draft pick Sterling Shepard will get his first chance to show off his skill set with the Giants star quarterback running the show. Shepard seems to have the second wide receiver spot on the depth chart locked down so the question is who will fill out those remaining spots. Victor Cruz’s struggle to get on the field and stay there has made it difficult for the Giants to continue to evaluate him and therefore he’s in a tenuous position right now. Starting to take snaps on the practice field next week is a vital step in his possible resurgence. The wide receivers that should get plenty of snaps include Roger Lewis, Tavarres King, and Myles White. Darius Powe and Anthony Dable are the two receivers with size who will also get their fair share as they attempt to leave their mark on the game. The defensive line will attempt to repeat their dominant effort from preseason game one against the Dolphins. In a brief showing the unit consisting of Jason Pierre Paul, Jonathan Hankins, Damon “Snacks” Harrison and Olivier Vernon has already shown what they’re capable of. The second game is a chance to build on that strong effort and continue to prove they have what it takes to consistently give opposing quarterbacks fits all season long. Owa Odighizuwa played exceptionally well against the Dolphins and the Giants will look for that same kind of energy against the Bills. The middle linebacker position has become a heated competition between Kelvin Sheppard, Jasper Brinkley and Keenan Robinson. The question for these three against the Buffalo Bills is who makes an impact and how do the Giants dole out the snaps among them. They’re all vying to be the man in the middle and it seems as though the Giants are willing to let that competition continue to play out.